Toasted Almond Cheese Dip recipe is a quick and easy dip recipe for the holidays or game day appetizer idea! 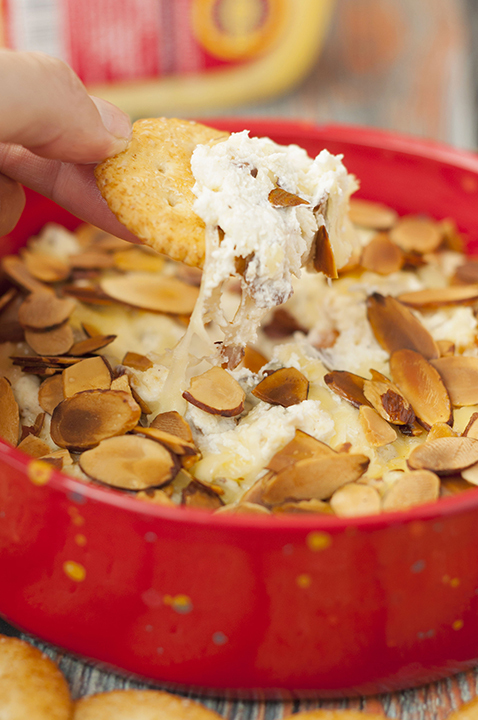 Who doesn’t love a hot, creamy cheese dip topped with crunchy sliced almonds? Cheese is my favorite food. Period. This is the time of year when warm, gooey cheese dips are everywhere. I am not complaining as I can seriously live off of appetizer dips. The texture of this Toasted Almond Cheese Dip is amazing and different from the usual cheese dips you’re used to having at holiday parties and game day parties. 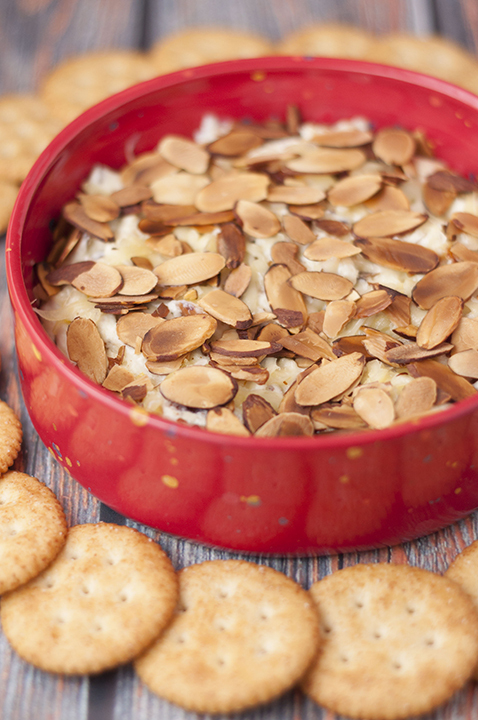 The crunchy, toasted almonds on top take this dip to the next level! I also have an awesome giveaway to tell you about just in time for the holidays. Scroll down for more details on how to enter! I used Jarlsberg cheese in this recipe as it is the perfect cheese for melting into a dip. I enjoy their cheese with crackers on a regular basis, but sometimes I like to take advantage of how well it melts and turn it into an amazing cheese dip. Anytime I make a cheese dip I always try to use high quality cheese as it really makes a difference in taste and texture! This dip stays creamy and melty for so long thanks to the Jarslberg cheese I used and it’s perfect to have out on the table for the holidays to snack on. What makes Jarlsberg cheese special is that is has been one of America’s favorite specialty cheese brands for over 60 years. I remember having this cheese at holidays while I was growing up. You how food that reminds you of your childhood just makes it extra special? The classics that everyone knows and loves and cause us to get all nostalgic are the best. My Pepperoni Pizza Bread is another one of those recipes because my mom always made it for Christmas Eve when I was a kid. Jarslberg cheese is a premium brand still made the same all these years later with the same secret. They use a Norwegian recipe developed way back in 1956: the combination of traditional cheese-making and modern technology is what gives their cheese that unique flavor. It’s hard not to appreciate it as so many do. Fun fact: the average dairy herd in the U.S. is approximately 187 cows! The majority of the country’s products come from these large farms. However, Norway has an average of 26 animals on their dairy farms. Norway’s clean air combined with their smaller farm size means the animals roam in larger, purer pastures. Hey, you learn something new every day, right? 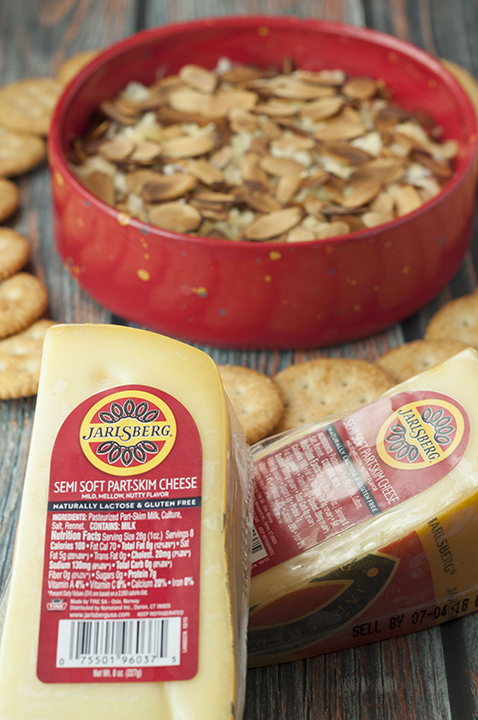 If you’re wondering about the taste of Jarslberg cheese, it has a mild, buttery, nutty taste with a very smooth and silky texture. Their cheese is known for it’s distinctive holes and it is a very versatile cheese, which I love. 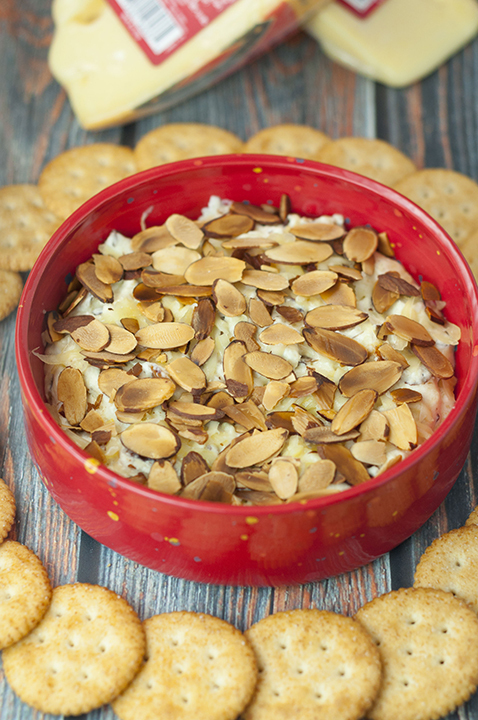 You can cut it up and add it to your cheese boards, pizza, salads, burgers, or turn it into a recipe like I did with this toasted almond cheese dip! It pairs great with sweet and tart ingredients such as sweet jams and tart fruits. Welcome to my heaven with this toasted almond cheese dip. 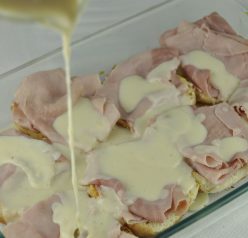 It’s great for entertaining a crowd or just a fun appetizer for any occasion! It is classy, simple to make, and absolutely delicious. Don’t be surprised if you find yourself licking the dish! Hot Corn and Cheese Dip – this one is healthier and one of Mr. Wishes’ favorite warm dips! Chili Cheese Dog Wreath Dip – if you’re looking for a show-stopper, this one is it! It’s a combination of chili dip and pigs in a blanket and great for game day! 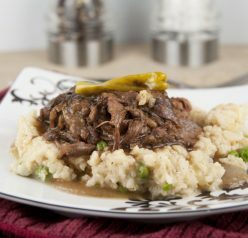 Philly Cheesesteak Dip – this dip will blow your mind and your taste buds! Roasted Red Pepper Dip with Feta – this one from my friend Kalyn is low-carb, meatless, and gluten-free if you’re looking for something a bit lighter! 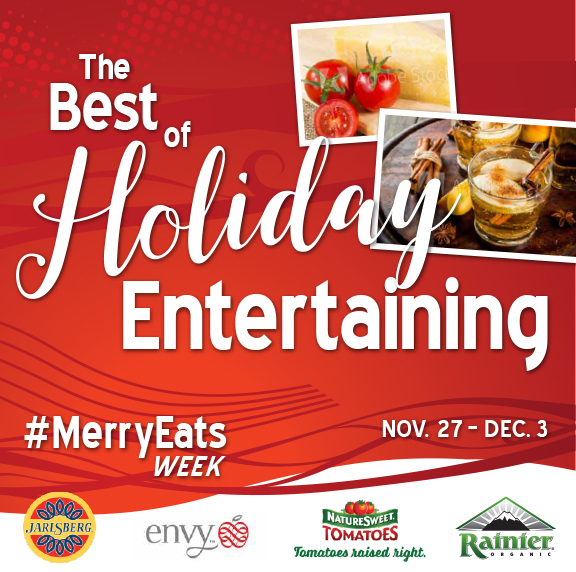 Myself, Jarlsberg Cheese, Envy Apples, NatureSweet Tomatoes, Rainier Fruit, and some amazing bloggers are giving away a holiday entertaining package for #MerryEats week! 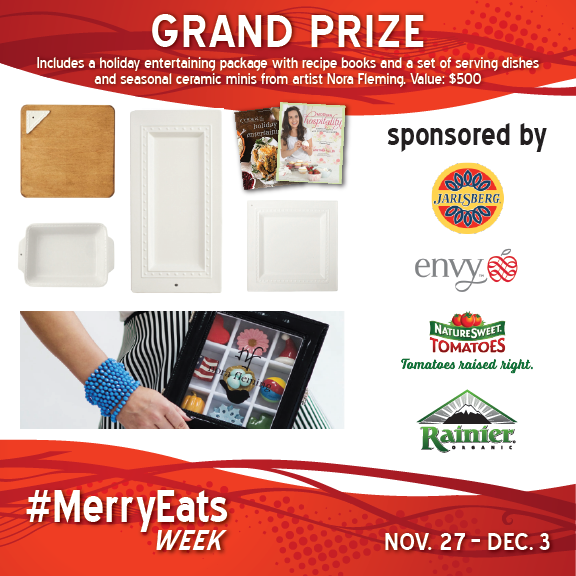 It includes Cook’s Illustrated Holiday Cookbook and our very own Whitney Miller’s Modern Hospitality along with a host of serving dishes and seasonal minis from artist Nora Fleming! This serving ware is perfect for every holiday and entertaining event and her ceramic mini’s allow you to transform your serving dishes for every holiday. The value of this prize package is $500! Scroll down below the recipe to fill out the EASY form to enter. Giveaway run through 12/3! Toasted Almond Cheese Dip recipe is a quick and easy dip recipe for the holidays or game day appetizer idea! Who doesn't love a hot, creamy cheese dip? *If you can't find Jarlsberg Cheese, use any swiss/buttery/nutty/mild cheese in it's place. 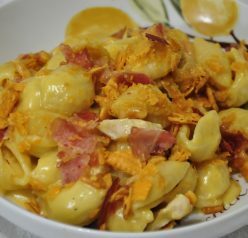 In a mixing bowl, combine cream cheese, sour cream, salt, pepper, nutmeg, Jarlsberg cheese and ½ cup almonds. Mix with a spoon to thoroughly combine, then pour and press into a small baking dish. Bake for about 25 minutes or until bubbly. Remove from oven and top with remaining almonds. Serve warm with crackers/pita chips/pretzels. Enjoy! Disclaimer: Thank you to Jarlsberg Cheese for sponsoring this conversation. All opinions remain 100% my own, as always. Thank you for allowing me to share the brands and products I use regularly and love. What an amazing dip and fantastic giveaway! I’ll be all ready for the holidays with everything you’ve got here! This dip looks so good,will make soon thanks. Yummy! I love this! Perfect for holiday entertaining! I can pretty much inhale cheese dips during the holiday season and this looks wonderful!! This looks SO super tasty! I’m totally making this for my holiday party.